Unlimited Motivation – Get Your Free Copy Now! Hate feeling lazy and unmotivated? Wish you could conquer laziness and stop procrastinating? Want to be productive, achieve success, and feel great? What if you could unlock unlimited motivation and conquer your goals? Unlimited Motivation teaches you one of life’s most important skills. A skill that can mean the difference between achieving success and settling for “good enough” — the ability to master your motivation and state of mind. 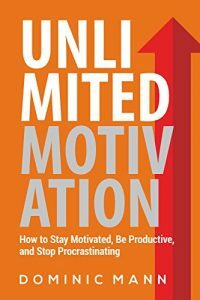 By the time you’ve finished reading Unlimited Motivation, you’ll know exactly how to get yourself super pumped, stay motivated, and smash through all your work while feeling great. Discover the scientific studies that reveal exactly how motivation works. Learn the powerful hacks, easy habits, and proven techniques that enable you to unlock virtually unlimited motivation. How will you learn to skyrocket your motivation? The Harvard study that reveals how to boost motivation and eliminate stress — in less than 60 seconds! How to develop a “Kickstarter Routine” to replenish willpower and energy levels. The ancient philosophy that enabled everybody from slaves to Roman Emperors to overcome obstacles and unlock motivation — just with their mindset. The motivation hack that enabled Muhammad Ali to become the greatest boxer of all time. Unlock unlimited motivation and soar to success. Feel great, do great, be great. To supercharge your life and conquer your goals, scroll up to the top and click BUY NOW!